Do you manufacture to my dimensions and just turn up with the glass? No, all glass is manufactured to our dimensions following a site survey from one of our partitioning experts. Before we visit the site, we provide you with an accurate price based on your dimensions and layout that you have provided. Before we confirm the order, we will ask all the appropriate questions and for some quick photos of the site location. Once we are happy we will send someone out to survey the site and measure accurately. If the quote needs to be adjusted for any reason, we will let you know and then confirm the order with you. We then manufacture the glass. Yes. A member of our team will visit your project site to carry out a professional survey. They will take accurate measurements, check the site access and location. We will then manufacture the partitioning to our survey dimensions. We do not manufacture to your dimensions. We’re based in Essex, just outside London. The majority of our installations are in London, South East and East of England. Check out our map to see if we have worked near you recently. From the point of ordering it typically takes 2 – 3 weeks. Certain specialist products do have extended manufacturing times i.e. fire-rated glazing will be 4 to 6 weeks. Double glazed doors will be 4 or 5 weeks. This type of work is normally carried out by a builder. In most cases, we don’t install solid walls. But please contact us to discuss your requirements. Our standard glass partitioning is not fire rated However if this is a requirement we do offer suitable fire rated products. Fire-rating can be a complex area and will often require further advise and information. Once you know the specific fire-rating please contact us for a bespoke quote. What are the sound proofing properties of your system? Upgrading to a double-glazing system will provide you with 41db rating. This system is usually installed to divide offices where soundproofing is a requirement. The type of door you choose can also effect the level of soundproofing. The most effective type of door is a framed glass door. Please call us to discuss your requirements so we can advise the best solution. All soundproofing however depends on the ceiling, flooring and how the office is furnished as these can all make significant differences to the level of sound proofing you will get. Our standard colour is RAL 9010 White which has the quickest lead time, however you can have any RAL colour. Manifestation is a legal requirement by Building Regulations. A manifestation film is applied to the glass to prevent people from walking into the glass. Usually the standard is 2 rows of identifying demarcation which is the minimum requirement to meet this standard. Yes, the legislation is in place to stop people from walking into the glass, by making it clearly visible by placing marking sat strategic places on the glass. Whilst this is something that is necessary we can help create something that is stylish and desirable for you glass partitioning. 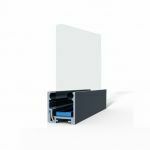 What happens if there is pipework or trunking in the way? In most cases, we can come up with a solution, usually ‘notching’ the glass or shaping the glass work to go around the obstruction. Please contact us to discuss further so we can propose the most suitable solution. Where is the glass manufactured? We get our glass from a UK manufacturer where it is manufactured to BS EN 12150 and it also complies with the CE declaration of conformity. 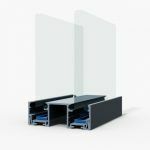 How safe is it to have glass partitions? 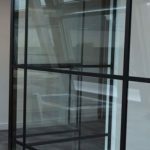 Can the glass partition be easily removed as part of dilapidation if moving? Yes! Our systems are fully demountlable and can even be moved to be re installed into another space. 95% of our glass is made from recycled glass as well as being recyclable at the end of the use, making glass partitions a sustainable choice.